Developable area: 500 sq. kms. 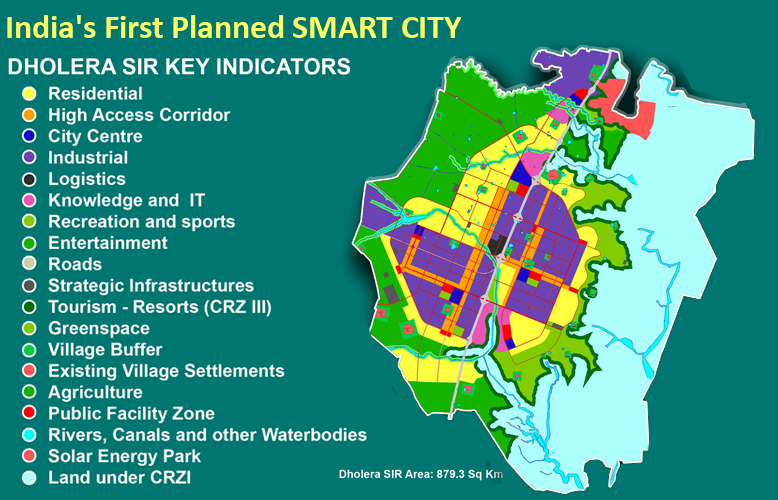 "The Development Plan, taking into account the DMIC objectivs and goals, should focus towards creating and enabling environmentto protect local industries, enhance investment climate, improve quality of life, upgrade human skils, create world class infrastucture and attract global investment". Project goals are to double the employement potential, triple industrial output and quadruple exports from the region in next five years. Identified as a Greenfield port, it will be developed along with private sector participation by Dholera Port Limited (promoted by J K Group and Adani Group). 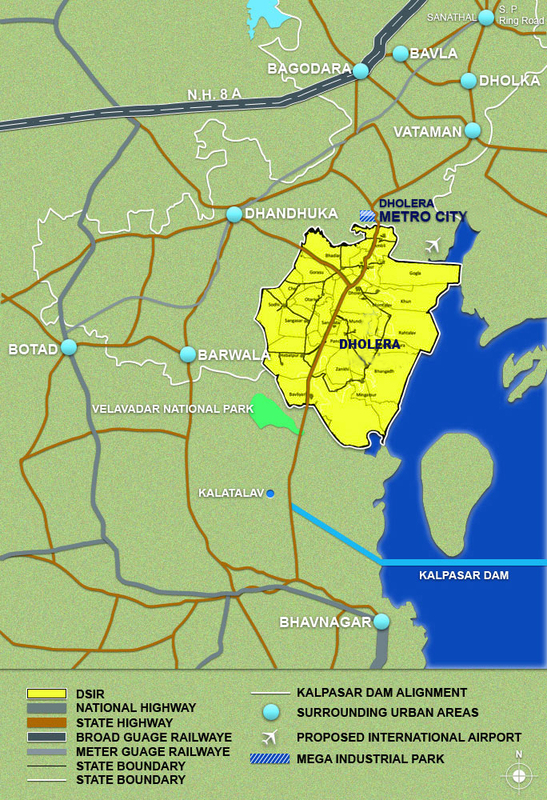 Dholera is in proximity with the coastal line. It is covered by water faces on three sides, namely, on the east face by Gulf of Khambhat, on the north side by Bavaliari creek and on southern side by Sonaria creek. Proximity to Ahmedabad has provided Dholera a strong locational advantage with a vibrant manufacturing base and investment scenario. The project is spread over an area of 35,000 hectares. The processing area which is proposed is 14,000 hectares and rest is non- processing zone. Dholera port is primarily involved into handling general cargo, dry bulk, containers, ship breaking and chemical handling facilities. 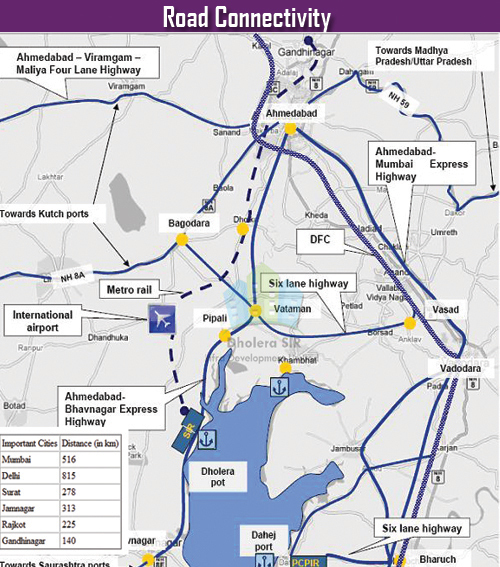 Strategically located, the Ahmedabad-Dholera industrial region lies within 100 km from the Dedicated Freight Corridor (DFC) in Southern Gujarat. 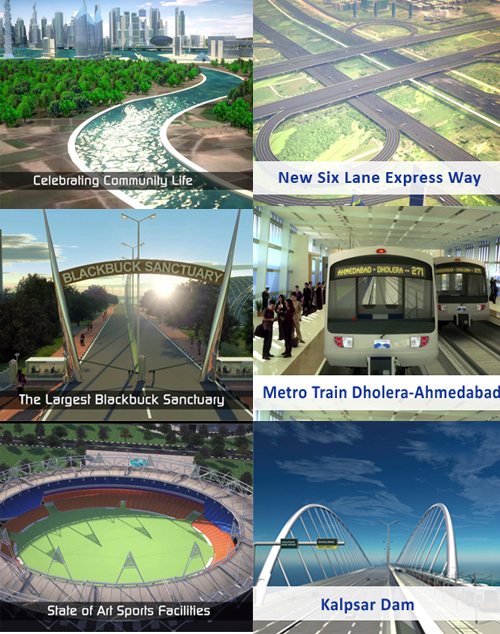 National Highway 8 connects the Dholera Special Investment Region with Ahmedabad, Bhavnagar and Mumbai. 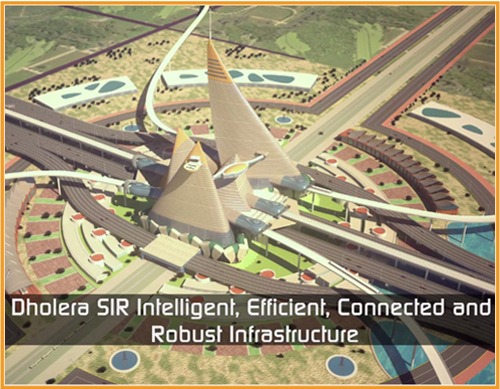 Dholera itself has good connectivity with National Highway (NH) 8 (Anand) and 8A (Bagodra), augmenting Bagodra -Bhavnagar, Bagodra- Surendranagar- Radhanpur links. 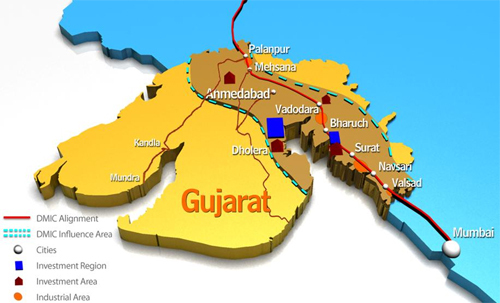 As a part of Golden Quadrilateral, the 500 km Mumbai- Ahmedabad- Vadodara Express way connects the region. In order to make the region more assessable, an airport and a port are proposed in this region. 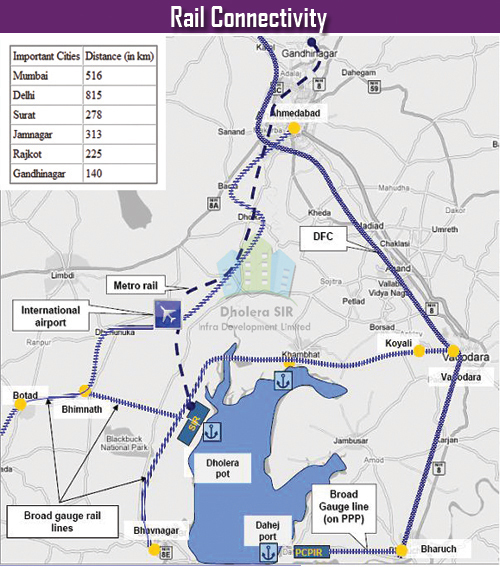 The port site is proposed to be connected by road with Ahmedabad – Bhavnagar highway at a distance of about 11 kilometres. Almost 2,057 hectares of Government land was allocated for the development of port. 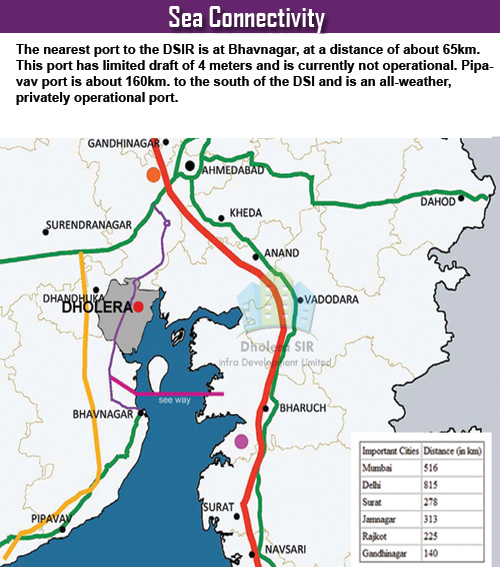 site Rail connection is being planned for Dholera, while the nearest meter gauge connection is Bhavnagar (34 km) and the nearest broad gauge station is Tarapur (103 km). Self governed economic region enjoying full support of the government and full potential for private sector participation. Logistic support of the Delhi-Mumbai Dedicated Freight Corridor linked with efficient rail and road network. 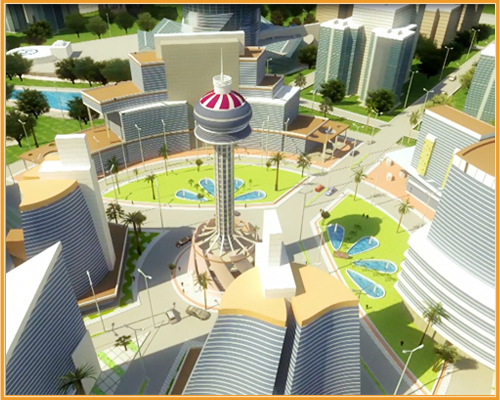 To be linked with Ahmedabad city with metro rail system. Proximity to sea port, Closeness to international airport. Close to Gujarat International Finance City (GIFT). Close to Petro-chemicals and Petroleum Inv. Region (PCPIR). Set up the metro rail system & international airport. Potential for development as a multi-modal transportation hub due to lesser distance to all the northern Indian States.